NETWORK FINALS: FRESH OFF THE BOAT gained 0.1 in final numbers. CABLE HIGHLIGHTS: USA’s WWE SMACKDOWN took the top slot on Tuesday cable, up 0.05 to 0.90, and the season finale of SHOOTER ticked up to 0.49. History’s CURSE OF OAK ISLAND lost a tenth to 0.82, and FORGED IN FIRE was up 0.04 to 0.55. OWN’s THE HAVES AND HAVE NOTS rose 0.08 to 0.71. 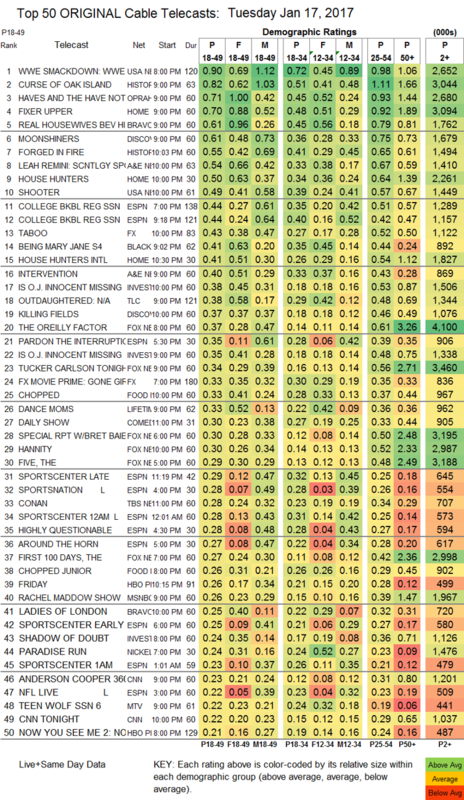 On HGTV, FIXER UPPER dropped 0.09 to 0.70, HOUSE HUNTERS gained 0.07 to 0.50, and HOUSE HUNTERS INTL was up 0.06 to 0.41. Bravo’s REAL HOUSEWIVES OF BEVERLY HILLS added a tick for 0.61, and LADIES OF LONDON was up 0.06 to 0.25. Discovery’s MOONSHINERS climbed 0.03 to 0.61, and KILLING FIELDS was down a tick to 0.37. On A&E, LEAH REMINI: SCIENTOLOGY & THE AFTERMATH fell a tenth to 0.54, and INTERVENTION was at 0.40. ESPN’s pair of COLLEGE BASKETBALL games were both at 0.44. FX’s TABOO tumbled two-tenths from last week’s premiere to 0.43. BET’s BEING MARY JANE dropped 0.15 to 0.41. Another night of ID’s IS OJ INNOCENT was at 0.38/0.35, down from Monday’s 0.48/0.46. 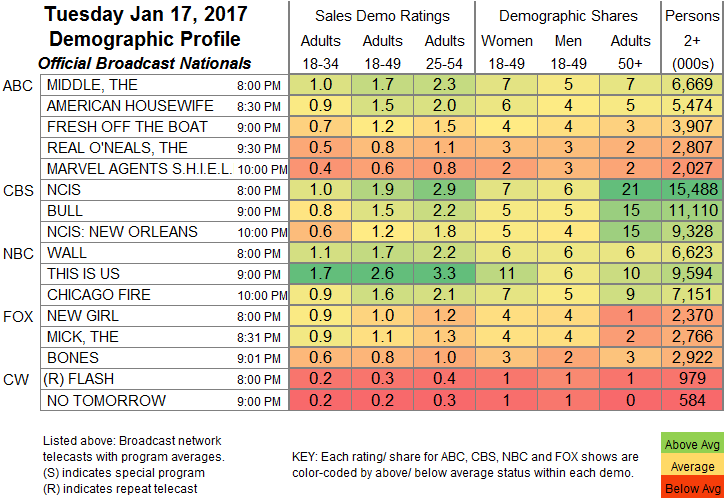 On TLC, OUTDAUGHTERED lost 0.06 to 0.38. Food Network’s CHOPPED dropped 0.08 to 0.33, and CHOPPED JR was down 0.04 to 0.26. Lifetime’s DANCE MOMS held at 0.33. On MTV, TEEN WOLF gained 0.03 to 0.22, and SWEET/VICIOUS ticked up to 0.07. TEACHERS returned to TV Land at 0.14, and THROWING SHADE premiered at 0.08. Tru’s BILLY ON THE STREET was down 0.02 to 0.10.